Applications are invited from suitable Candidates to fulfill the 04 Jobs in Education Department 2018 Governed by City District Government Peshawar Published in Daily Mashriq Newspaper 06th February 2018. Candidates fulfilling the required criteria may apply for New Khyber Pakhtunkhwa Government Jobs 2018 against the titles of Lady Cashier (BPS-08), Senior Lab Assistant (BPS-12), Lady Clerk (BPS-11) and Lab Assistant (BPS-08). 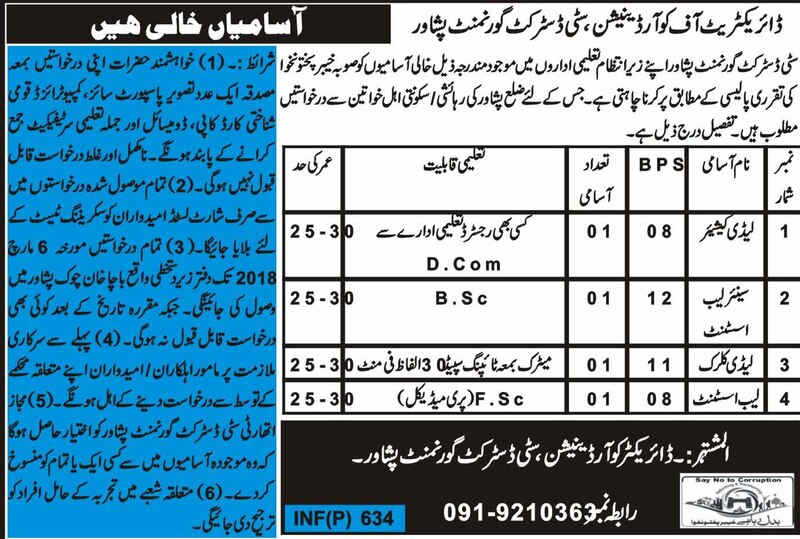 Only District Peshawar Domicile holder Female Candidates will be applicable to apply for these Jobs.